These are strange days, indeed, for public sector unions. Big developments, not always happy ones, are everywhere. Yet the dearth of labour reporters and collective yawns from editors and the public alike have combined to obscure groundbreaking events that would have dominated front pages not so long ago, when unions were considered important. These days, it’s all business, all the time. Employees struggling collectively to improve their lot in life, or even just to hang on to what they have, is so last century. Cue the top 10, top 50, top 100 lists of corporations and their powerful executives. Cue the latest real estate blip. Cue record bank profits. Now, that’s news! In beautiful British Columbia, a series of astonishing tentative agreements were signed this week, covering more than 50,000 government employees, to scant fanfare. They are like no contracts in the history of public sector bargaining in this province. Snore. Few, apart from The Vancouver Sun, seemed to notice or care. But let this aging, ex-labour hack drone on about why they are significant. Even more unusual, negotiations were concluded four months (!) before existing contracts were due to expire. That is certainly a first. Think of the savings on strike ballots . . .
And finally, there is the fascinating, added fillip of a bizarre, economic growth booster. A clause in the agreement holds out the promise of top-up wage increases, should the B.C. economy suddenly roar to life, responding, no doubt, to Christy Clark’s unwavering belief: If you close your eyes, click your heels and wish real hard, dreams can come true. These contracts are in addition to an earlier, tentative landmark agreement involving 17,000 members of the Health Sciences Association, one of the province’s three major health unions. Terms are similar. Such lengthy, ultra-modest settlements, covering a quarter of the provincial public sector, will inevitably serve as benchmarks for other negotiations. Even though the more militant B.C. Nurses Union and the ever-tough B.C. Teachers Federation have yet to begin bargaining, the contracts, if approved, are a big coup for a government obsessed with keeping costs low. Still, it’s not hard to understand why union negotiators in B.C. opted for these long, cheap deals. They represent security. There are no rollbacks. Elsewhere, public sector unions are under heavy attack, their benefits and pensions a target for many governments. It’s in keeping with the race-to-the-bottom attitude that seems to believe forcing wages and pensions lower will somehow boost the economy. Hello? Scrounging for pennies, er nickels, is the new reality. Look around. In oil-rich Alberta, where public sector strikes are already illegal, the government has moved to strip the Alberta Union of Provincial Employees of its right to binding arbitration, as well. Even more draconian is a provision making union leaders liable for large fines if they even call for a strike. 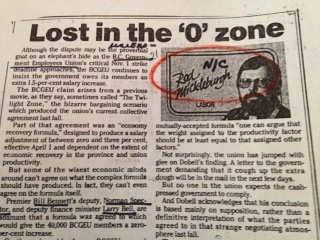 This throwback to the reactionary, anti-union days of W.A.C. Bennett in British Columbia 50 years ago is brought to you by Premier Alison Redford. Yes, the same Alison Redford, who once worked with Nelson Mandela to improve human rights in Africa. “He taught me that the best advice comes from people who have been working in the trenches,” said Redford, on the great man’s death. Hmm . . .
And in Ottawa, Treasury Board President Tony Clement continues his merry, anti-union way, with barely a squeak of public concern. At a recent meeting with Clement, Robyn Benson, head of the Public Service Alliance of Canada, asked for union consultation on the government’s plans to gut their bargaining rights. She also requested the minister stop calling them “union bosses,” a pejorative term belying the fact labour leaders are democratically elected and responsible to their membership. Afterwards, Clement, who supports right-to-work laws, tweeted that Benson wanted “co-governance with Parliament. Takes ‘union boss’ to a whole new level.” Thanks, Tony. Clement is sponsoring legislation giving the government power to decide who can go and can’t go on strike. It would also compel arbitrators to bring in wage settlements based on the government’s “ability to pay.” So much for free collective bargaining, even for mild, federal unions who hardy ever go on strike. The media has tended to characterize this as “a battle” with labour. It’s hardly a battle, when one side has all the guns and ammunition, and the other side little more than the right to say “We object,” as their forces are mowed down. Welcome to the new reality. It’s a funny old world.